The outlet airflow temperature of water lubricating oil- free single screw air compressor does not exceed 50 ํC, almost isothermal compression and high efficiency, Rotation speed 2930 rpm to make sure longevity of bearings and other accessories. While double screw dry oil free air compressor’s outlet air flow temperature is about 200 ํC, low discharge efficiency, rotation speed about 18,000 rpm, which affect the longevity of bearings and other accessories. Each compressor component has been thoroughly evaluated for its reliability and efficiency and optimized for easy servicing. 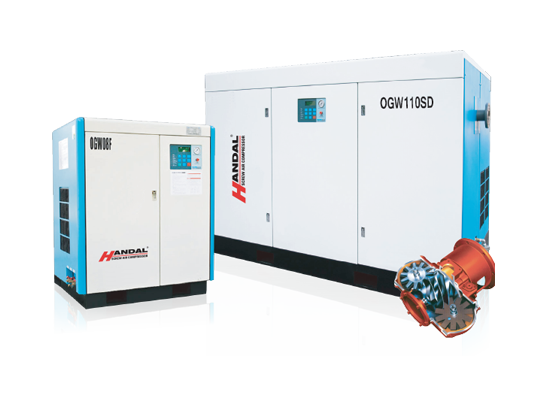 The Noise of water lubricating oil-free single screw air compressor is lower 10 dB or more than twin-screw dry oil-free air compressor. Water lubricating oil-free single screw air compressors eventually exhaust quality is the cleanest, The lubricating water rinsing the air and remove the air turbidity through the compression process of lubricating oil-free air in the single screw air compressor, but the dry oil free air compressor always inhale the air dust together and outlet directly, the gear also need lubricated oil to lubricate. Water-lubricated single screw air compressor adopting water lubricating to achieve to the compressed air without oil. The root cause that single screw could be lubricated by water is up to its structural advantages. Therefore, the contact stress on friction pairs is very small, it is for this reason the star wheel can be made of non-metallic materials, which in turn provides a convenient anti-corrosion conditions. When the worm and housing case adopts special copper alloy (anti-attritionand anti corrosion), the advantages of water lubricating could be fully reflected.